Update: Everything is confirmed now. The dates were right, but the Melbourne venue is actually the Palais. Tickets will be available for $75 Monday morning from here, however there is a MyTicketMaster presale from midday tomorrow. 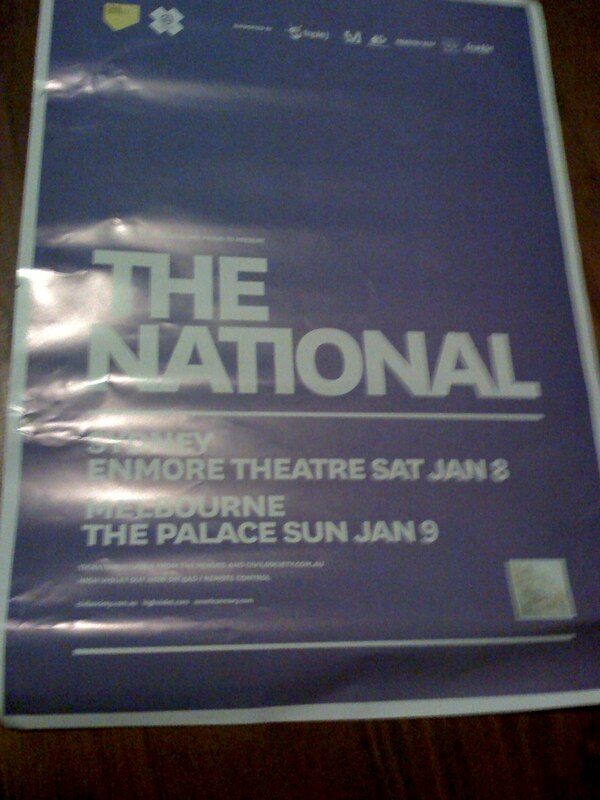 Here’s a poster that was up in the Melbourne CBD advertising that The National will be playing a Falls Festival sideshow at The Palace Theatre in Melbourne on January 9th, as well as in Sydney at the Enmore Theatre on January 8th. This is huge news, because as of now there have been no The National sideshows officially announced at all, which made it look as if they might have been doing one of those stupid all festival tours. Also, I’m totally claiming this as APYS‘s first ever exclusive. Edit: A few other posters have been found today (see here), however this was still the first place you could find out about the shows, which is pretty cool. Apparently the official announcement is tomorrow and the price will be $70. Win! I was a bit worried they wouldn’t do sideshows. I’ll defentily try to be there, thery’re amazing on record. You’re a legend for posting this. Been hoping they would do a side show for ages. This is the only place I could find that says anything about it. Cheers. Any further news on this announcement? Unfortunately no, there has been no official word yet. I’ve heard that apparently these posters might have been a bit premature and the shows might be on different dates, but all signs are pointing to the fact there will still be sideshows. Ahh…that would explain why there are not ticket details on any websites on the posters. Keep us updated! Absolutely hanging out to buy tickets! I saw leaks that they would be on sale 9am this mornign but where!??! where i ask!?! Well the dates are printed in the current issue of Rolling Stone, so I’d say these shows are pretty much confirmed. Before tickets go on sale however they’ll announce it officially and info about the shows will go up on the venues’ respective websites, including ticket links. 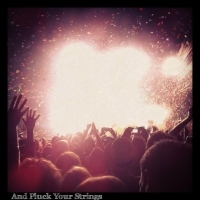 Don’t worry you definitely haven’t missed it, news would be all over the internet if there had been a presale. I’d be very surprised if there wasn’t an announcement next week. See the update at the top of the post for confirmed details. I’m slightly bummed about the venue change, but will still be amazing.